My family has finally perfected vegan and grain free / gluten free latkes and I am so excited to share them with you! Hanukkah celebrates the miracle of the oil, so fried foods are often featured at Hanukkah feasts. Every year we host a Hanukkah party, and of course the star of the show is the latkes. 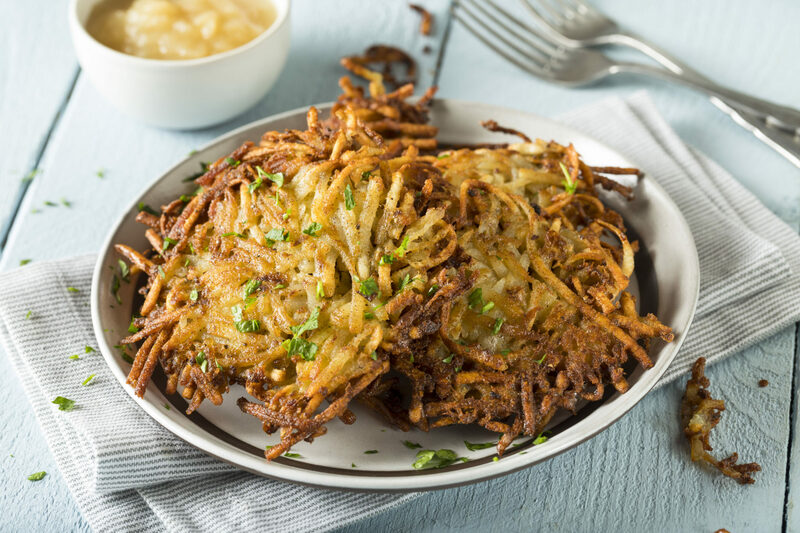 We have changed our recipe throughout the years to accommodate dietary sensitivities and preferences, and these win over those who are used to eating latkes made with egg and wheat flour. I hope you love this recipe as much as we do! Happy Hanukkah! Peel potatoes and coarsely grate by hand, transferring the grated potato to a large bowl of cold ice water. Soak potatoes for 2 minutes after last batch is added to the water, then drain well in a colander. Spread grated potatoes and onion on a kitchen towel and roll up jelly-roll style. Twist towel tightly to wring out as much liquid as possible. Soaking and wringing them out prevents the potatoes from oxidizing and changing colors. Transfer potato mixture to a bowl and mix in arrowroot starch, pepper, and salt. Heat 1/4 cup oil in a 12-inch well seasoned cast iron skillet over moderately high heat until hot but not smoking. Working in batches of 4 latkes, spoon 2 tablespoons potato mixture per latke into skillet, spreading into 3-inch rounds with a fork. Reduce heat to moderate and cook until undersides are browned, about 5 minutes. Turn latkes over and cook until undersides are browned, about 5 minutes more. Transfer to paper towels to drain and season with salt. Add more oil to skillet as needed. This recipe makes about 40 latkes to feed a crowd! ***Latkes may be made up to 8 hours ahead. Reheat on a rack set over a baking sheet in a 350°F oven for about 5 minutes. I tried these last night and they were perfectly crispy. I didn’t tell anyone they were gluten free and no one could tell a difference. Hooray!!! These latkes look delicious and crispy. I prefer that over the ones that are more like potato pancakes. I will give these a go.